Although located in the extreme reaches of western Maryland, the city of Cumberland has found itself a center of activity throughout its history. During its more than 200 years of existence, Cumberland has been a military fort, the origin point of America's first highway, the termination point of a monumental federal construction project, a western gateway to the Ohio River Valley, the processing center for rich coal fields, and a primary link on one of America's most successful railroads. Nestled dramatically at the base of converging mountain ridges and at the confluence of Wills Creek and the Potomac River, Cumberland conforms in its layout to the rugged topography within which it is situated. From its beginnings as a British fort to its place today as western Maryland's largest city, Cumberland has always lived up to its nickname as a "Queen City." When European settlers first began moving into western Maryland in the 1730s and 1740s, they encountered Native Americans residing between the Potomac and Susquehanna rivers. Conflicts ensued, and in 1744 the Maryland legislature purchased the land from the area's Native American's, observing they would settle "for nothing less than Blood or Money." This contract opened the area to official settlement. Germans, Swiss-Germans, and Scot-Irish from Pennsylvania quickly colonized the area. Although the Maryland legislature had "purchased" the area, Virginia and Pennsylvania claimed the land as well. More troubling to the British Empire were French traders intent on securing their rights to the land. In 1750 Virginia planters and English merchants established a trading house and small storehouse on land which is now the heart of Cumberland. The new trading post (later called Fort Cumberland) attracted the French, who moved south and west from their Lake Ontario forts, drove out the English traders and claimed the Ohio River Valley for France. In 1753, with tensions running high between the French and English, the Governor of Virginia sent a small company led by a young Virginian named George Washington to inform the French to leave English territory and return north. The French ignored Washington's warnings, and he returned to Virginia. In the spring of 1754, Colonel Washington returned to Fort Cumberland, this time with more men. Pushing north from Cumberland towards the forks of the Ohio River where Pittsburgh is now located, Washington's force (about 230 men) encountered 600 French and 100 Indians soldiers. An inexperienced 22 year-old, Washington did not withdraw, but instructed his men to build a fort, which he grimly named "Fort Necessity." On July 3, 1754, the French and Indian War officially began when both groups attacked the fort. 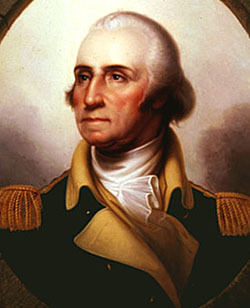 Washington, completely surrounded and one third of his men killed, surrendered. Washington and his remaining troops were allowed to retreat (without their weapons) and returned to Fort Cumberland. With the loss of the Ohio River Valley, Fort Cumberland became the primary staging and supply point for the British on the colonial frontier. The fort, and later the city, derived its name from the Duke of Cumberland, son of King George II of Great Britain. After British General Edward Braddock led another disastrous foray into the Ohio River Valley, George Washington served as commander of the Virginia troops during the French and Indian War, and spent a considerable amount of time in the Cumberland area. 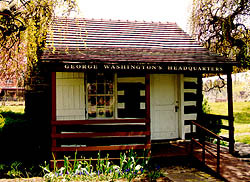 The cabin that served as his headquarters is the only building to survive from the Fort, and has been moved to Riverside Park. Washington's service in the area was important, because he became convinced that expansion west into the interior of North America and the Ohio River Valley came through Cumberland's valley. 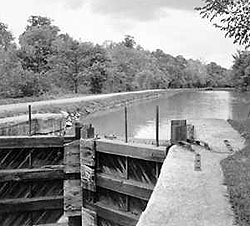 Washington later started a company (which failed) to make the Potomac River navigable between the Atlantic Ocean and Cumberland. In the years between the end of the French and Indian War and the beginning of the American Revolution, Cumberland grew as a town, was designated the seat of the newly created Allegany County, and was poised to become a major artery on the edge of the American frontier. Following the American Revolution, land hungry settlers began to push purposefully past the land west of the Appalachian Mountains. 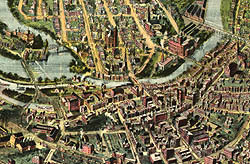 Cumberland grew slowly, until the much anticipated Chesapeake and Ohio Canal and Baltimore and Ohio Railroad arrived in the mid-19th century. These improved transportation routes, along with the increase development and trade opportunities they fostered, transformed this small town into the largest city in Western Maryland. Coal mining quickly became the most important industry in the Cumberland area. Some of the richest beds of soft, bituminous coal in the country lay within the hills and mountains of this region. After the Civil War, coal became one of Maryland's chief products and exports. Coal from the Cumberland area fueled the state's mills and plants, steamships in Baltimore's harbor as well as the US Navy fleet, and was traded to buyers from London, Brazil, Egypt, and beyond. Primarily Scotch and Welsh immigrants provided the labor force for these mines, immigrating with their families for the opportunities America offered. In the Cumberland region, miners escaped the indebtedness to the mining company that plagued miners in surrounding states. 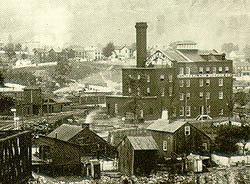 The company store system, in which miners were forced to purchase all their supplies and household needs from the mining company, was outlawed in Maryland in 1868. A comparatively high proportion of miners were also homeowners, as local mining firms found it more profitable to sell houses to their miners, than establish "company" housing. Cumberland's coal mines were constructed with horizontal shafts, far less dangerous that the vertical mines of Pennsylvania and West Virginia. Still, Cumberland's miners blackened from head to foot when they emerged from a mine at the end of a day knew that the carbon-filled air, which corroded the lungs overtime, would lead to an early death. Various manufacturing plants were established in Cumberland, because of its proximity to sources of fuel and raw materials and its position on major transportation routes. 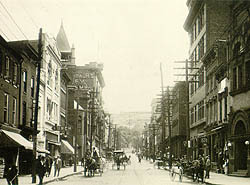 Cumberland blossomed as a result, the downtown commercial area thrived, and impressive residences built around the city reflected individual prosperity. The city became the economic center of the region. Rural farmers, industrial workers and miners traveled downtown along with successful industrialists, businessmen and county officials. Glass manufacturing played an important role in the growth of Cumberland from 1880 to 1930. The Warren Glass Works Company located in South Cumberland, and the Cumberland Glass Works located at the west end of North Mechanic Street, were established in the early 1880s and would become the two major glass making firms. The industry used local coal as an economical fuel, and native pure silica sandstone in the making of the glass. At the peak of production around 1920, well over 1,000 people were employed in the glass factories and decorating shops. The onset of the Great Depression, coupled with the destruction of seven factories by fire dealt the glass industry in Cumberland a fatal blow. Recently, however, a glass decorating business opened in the city, using some equipment from the former companies. Breweries existed in Cumberland as early as the 1870s. The Cumberland Brewing Company, which operated on North Centre Street until the late 1950s, was established in 1890. The German Brewing Company started in 1901 on Market Street and operated until 1974 when it closed its doors, marking the end of an era of local beer production. As coal production diminished in the first quarter of the 20th century, the auto-industry moved into Cumberland and promised new jobs for former miners. Kelly-Springfield Tire Company came to Cumberland to manufacture tires in 1921. At its peak the company employed well over 2,000 people. Of the area industries still operating today, two date back to before the turn-of-the-century. Westvaco, now Allegany County's largest employer, was founded in 1888. The Luke Mill, which employs about 1,950 Tri-State area residents, is continuing its $250 million improvement program. A new wood yard and administration building are the latest additions. Cumberland Steel Company, now operated by George Wyckoff, was established in 1892 by the McKaig family, whose Greek Revival mansion still stands on Washington Street.